On the 6th of October, Glass Door Homeless Charity hosted their largest ever Sleep Out event to date at the Duke Of York Square, Chelsea. 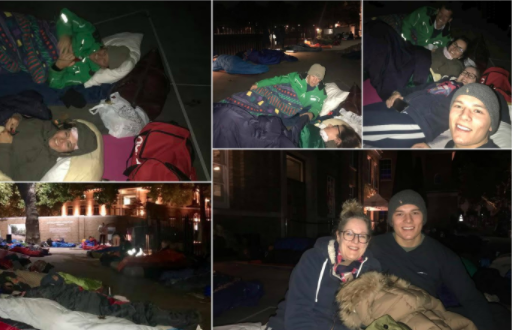 The Martin’s team, comprising Richard Bourne, Armanda Keith, Debbie George and Thomas Rogers rolled out their sleeping bags and joined the charity in its fundraising efforts and managed to raise a whopping £800 so far for the charity! Glass Door operate night shelters in churches for homeless men and women during winter. They are London’s largest emergency winter night shelter and they provide safe, warm places to sleep for just under 100 people every night during winter as well as helping guests build more stable futures. Glass Door aimed to raise £200,000 through the Sleep Out event to ensure they can run all their shelters next winter. So far, they have raised almost £160,000 and the Martin’s Properties team are very proud to have helped this outstanding association and take part in an event that could save someone’s life this winter.